A glorious and moving multi-generational, multicultural saga that begins in the 1940s and sweeps through the 1960’s in Trinidad and the United States. 'Til the Well Runs Dry first caught my eye because of the striking and colorful image on the cover, but it was the summary that had me convinced I needed to read it. I haven't read anything set in Trinidad, and I love discovering new places through the pages of a book. The setting combined with the words multi-generational saga had me intrigued! I love reading historical fiction, particularly stories that follow a single family over a period of time. I watched a video where the author, Lauren Francis-Sharma, introduced her book. She described how she felt a sense of loss when her grandmother had a stroke because she realized that she'd never asked her grandmother about her story -- her journey to the US from Trinidad and the reasons why she left. So, Francis-Sharma wrote 'Til the Well Runs Dry as a way of "filling the void." Hearing her describe it that way in the video really touched me. It's a sobering and sad moment when you realize you haven't just lost the person you love, but also the opportunity to ever learn anything more from them. There's a moving line in the book where one character says, "You never miss the water 'til the well runs dry. Plenty of people t'ink they'll be fine until the person they need does be gone." And isn't that the truth? You take something for granted and never realize just how much you need someone until they're gone. That idea and line was one of my favorite aspects of the story. And, in some ways, what I loved most about this book was Francis-Sharma's reason for writing it. 'Til the Well Runs Dry tells the story of Marcia Garcia, a talented, 16-year-old seamstress who is living alone and raising two small boys when the novel opens. She soon meets Farouk Karam, a young policeman who begins to try to win her love. When he enlists the help of a woman who is practiced in the art of obeah (folk magic), he never imagines the consequences that will follow. The book follows these people over the course of 20 years in both Trinidad and the United States. While I liked the book, I didn't completely connect to it. I felt like I was observing the characters from a distance - the story never immersed me into their thoughts and feelings. Many of the important moments in the book didn't seem to have as much emotional resonance with me because of that fact. The characters speak in dialect, which I found occasionally distracting or awkwardly used. There is a lot that happens in the book, but it was a slow read for me overall. At times, I wished the book had a bit more focus -- it sometimes seemed like too much was happening too quickly. 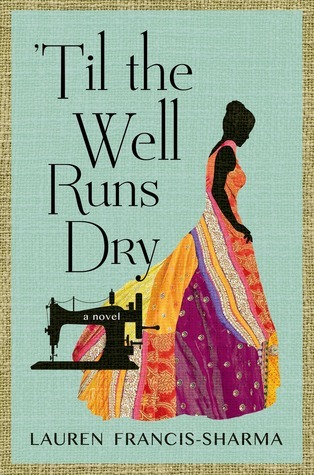 However, there were two things I really did enjoy about 'Til the Well Runs Dry - the setting and the way Francis-Sharma depicted how difficult it was to be a woman in Trinidad. I felt like Trinidad came alive through her descriptions, and I particularly enjoyed getting a sense of this country that I know so little about. I loved learning about this culture through the eyes of her characters, and it certainly left me wanting to find more books set in this place. Also, the struggle for a woman to get an education and do something different with her life was really evident in this story. I found those portions of the book really moving, and it helped me understand the characters in a new way. For example, a male teacher remarks to the older sister of one of his pupils, "I see your mammy does have Yvonne reading Wuthering Heights. Ambitious for a nine-year-old, eh?" If I could have, I probably would've told Mr. Aldous that Catherine and Heathcliff were easy for Yvonne -- a story about love could hold almost any girl's interest. I would've told him that the real challenge was teaching Yvonne about life, about history, about her country... I would've told him that what they didn't teach Yvonne in school was that without proper schooling, girls had no future in Trinidad, other than factory work, kitchen work, and babies. I would've said a girl had to fight to be a teacher, had to fight to be a policewoman, had to fight for work almost always against a more favored boy from Trinidad and from a half-dozen poorer islands. I would've told Mr. Aldous that I didn't want it to be too late by the time Yvonne understand Trinidad, like it had been for me. It may not be a new favorite, but I was still glad I read 'Til the Well Runs Dry. I wish I had been more invested in the characters, but I loved discovering more about a place that I wasn't really familiar with before. I'd be most likely to recommend this to readers who are looking to learn more about a different culture or people who love a fascinating setting since I felt those were the two strongest elements of this book! "I wanted to be somewhere my children could be more than a failed exam and the offspring of shame and I could be more than poor and pained. Because I had been running, because I hadn't given myself a moment, I lost things I didn't know I wanted until wanting them was all I had left." I love stories that are multi-generational and the setting sounds fantastic. I think sometimes dialects can be difficult, especially if it's not constant. Will have to give this a try though; sounds exactly like something I'd be interested in! I really, really love that cover! It's beautiful, and I can only imagine what it looks like in person. As for the story, I do like that it's multi-generational AND that it's set in Trinidad. However, I'm really picky about novels with the multigenerational aspect, mostly because I have to be invested in these characters and the family to really want to read and to really enjoy what I'm reading!